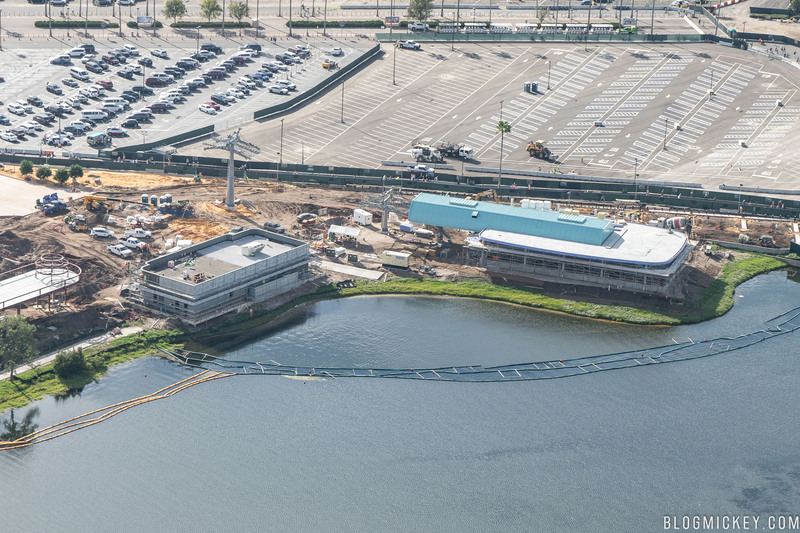 As we continue our look at Walt Disney World from the air, Disney announced the new Hollywood Studios entrance opening date as we were flying over it. 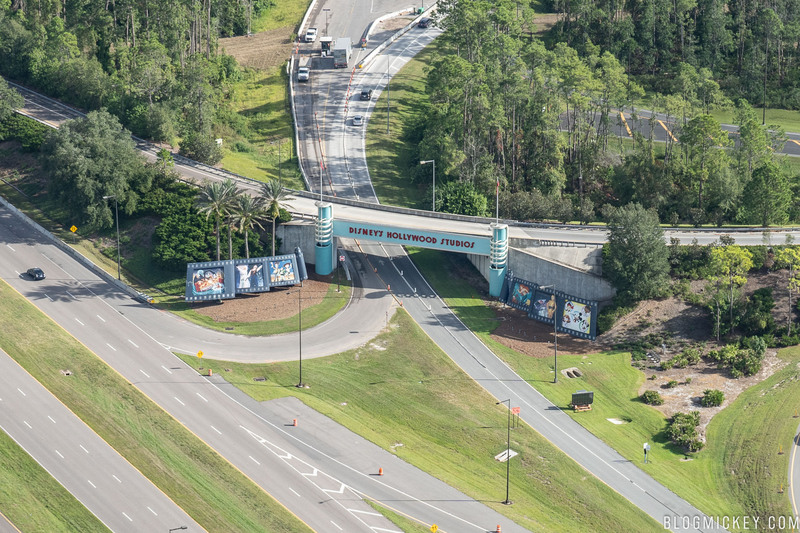 Beginning November 8th, guests driving to Disney’s Hollywood Studios will use the new entrance and exit located off of Osceola Parkway. 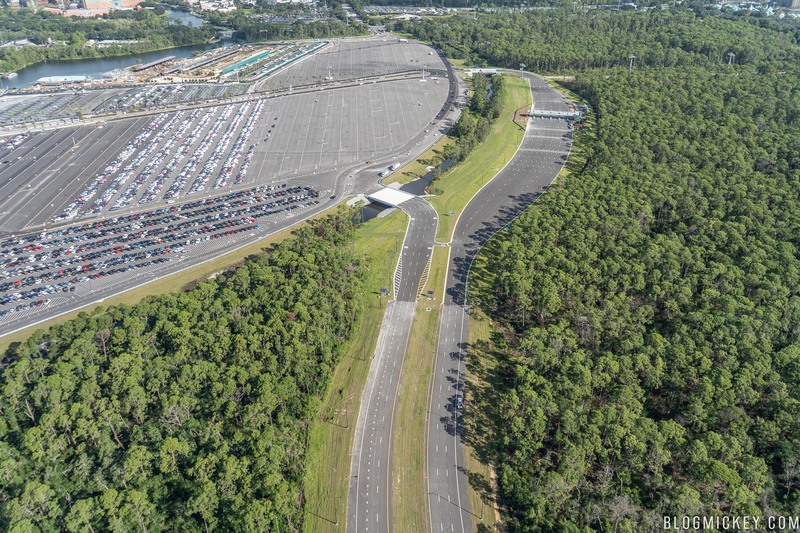 The current main entrance off World Drive and Osceola Parkway will be repurposed for Disney cast members only and the satellite entrance on Buena Vista Drive will be dedicated to buses. Vehicles coming from southbound Victory Way will also find a connecting road leading to the park. 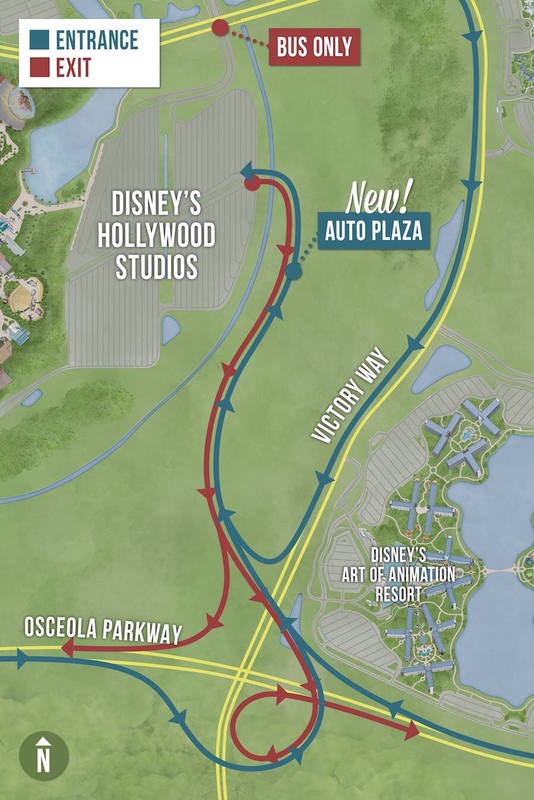 Here’s a look at the map provided by Disney. 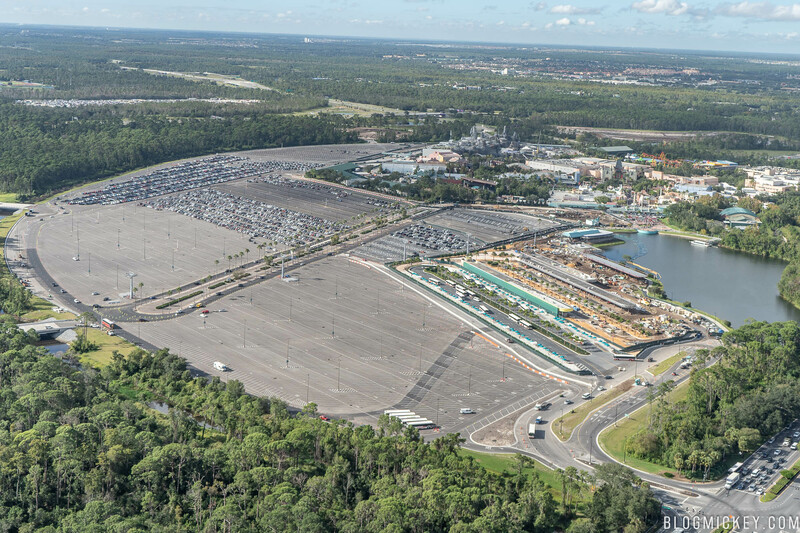 First, let’s take a look at the new parking plaza and entrance road. The first image below shows the entrance road and toll plaza on the right, and the new exit on the left. As far as the parking lot goes, there’s still some work to be done. 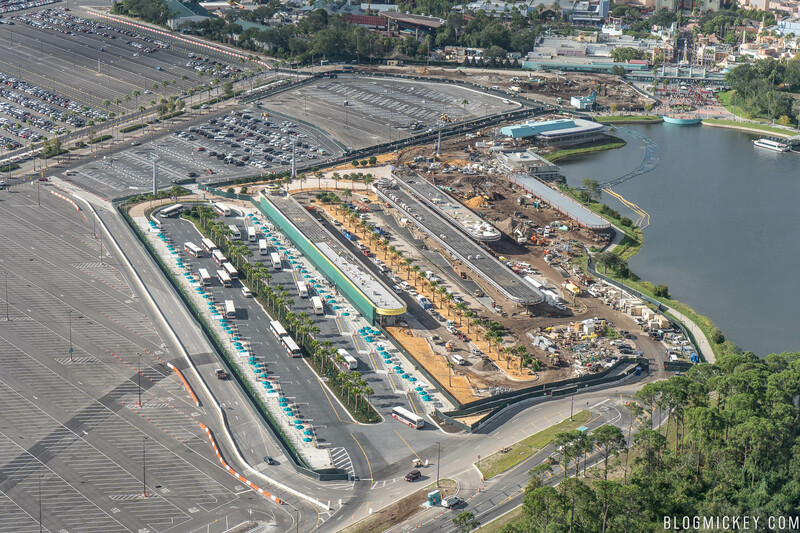 Here’s a look at how the entrance plaza seen above connects to the parking lot, almost exactly where the tram runs. A look at the whole parking lot. As you can see, the bus loop has shifted considerably in the past few months, with the new bus loop nearly complete. The current Buena Vista Drive entrance (bottom right) will be dedicated to buses starting November 8th. Here’s an overview of the new bus loops. Only the station closest to the bottom of the image is open at this time. 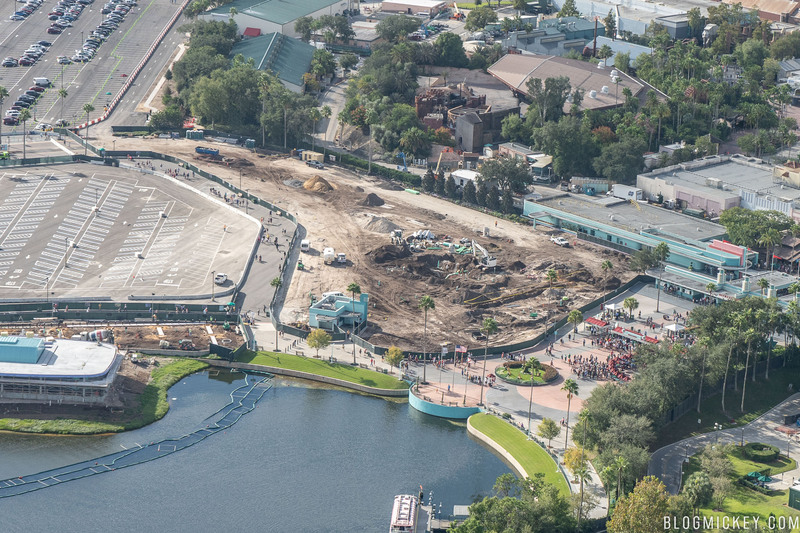 Moving on, we can see that the old bus loop, handicap parking, and tram drop off area has been completely demolished. 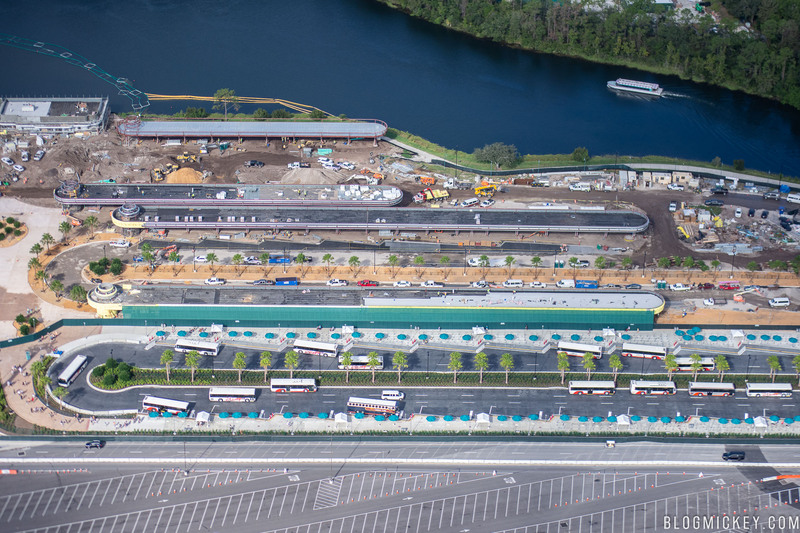 A walking route starts at the current tram stop in the top left of the image, and cuts through the new parking lot on the left side of the image and the new “entrance experience” construction on the right. 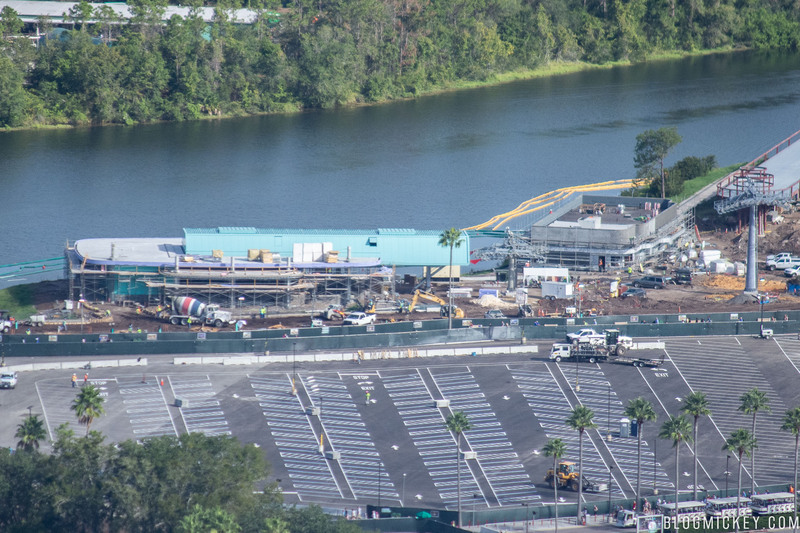 The Disney Skyliner structure (right) and nearby building (left) are progressing nicely. 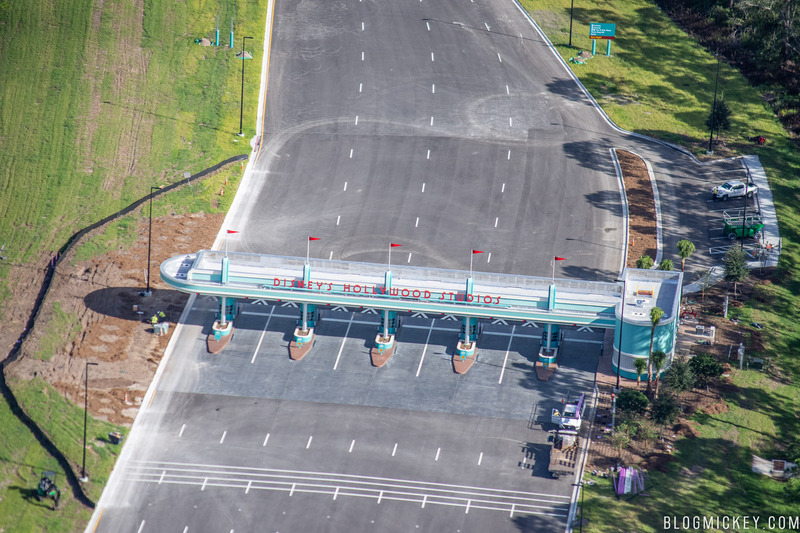 Finally, here’s a look at the World Drive entrance that will become a Cast only entrance on November 8th. 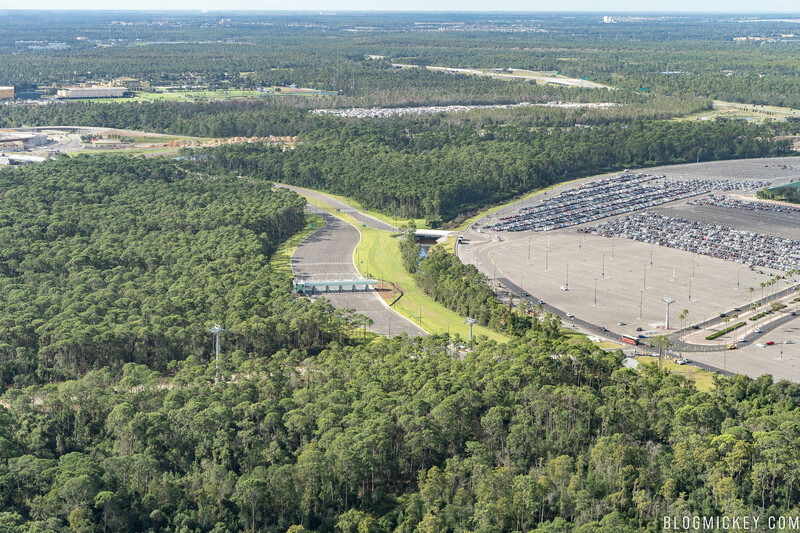 The World Drive entrance will take cast to an all-new parking lot that’s being constructed to the south of Star Wars: Galaxy’s Edge. 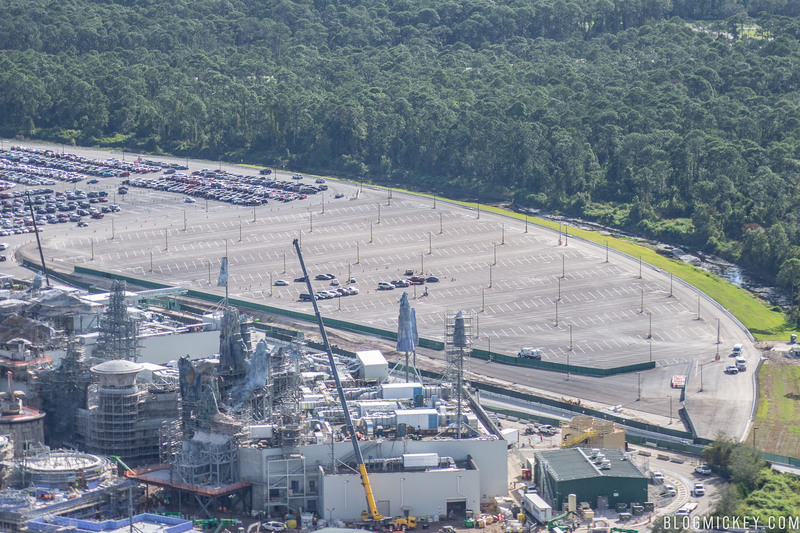 Do you know if the long walk to the entrance is a permanent part of the new parking lot, or is it temporary due to construction? 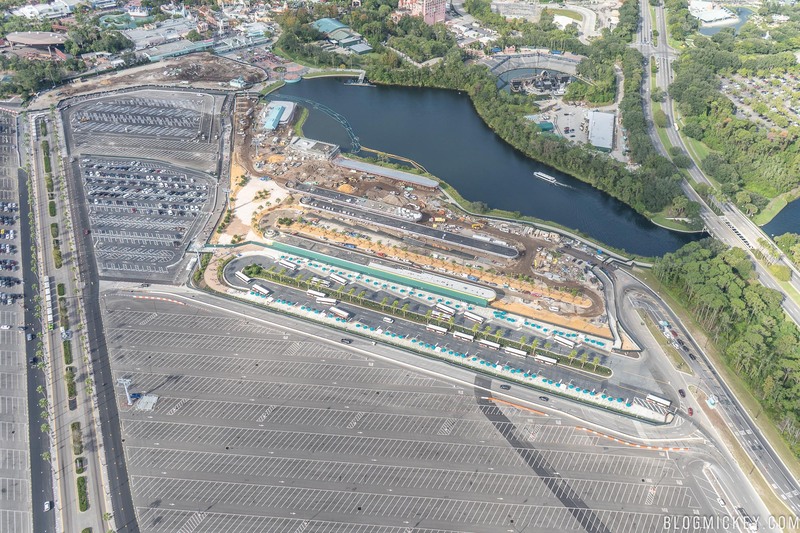 We will be arriving just after the new parking lot opens, and I’m hoping the walk to the entrance won’t be as bad as I’ve heard to walk to the park! Thanks!